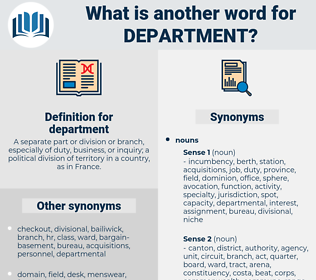 What is another word for department? 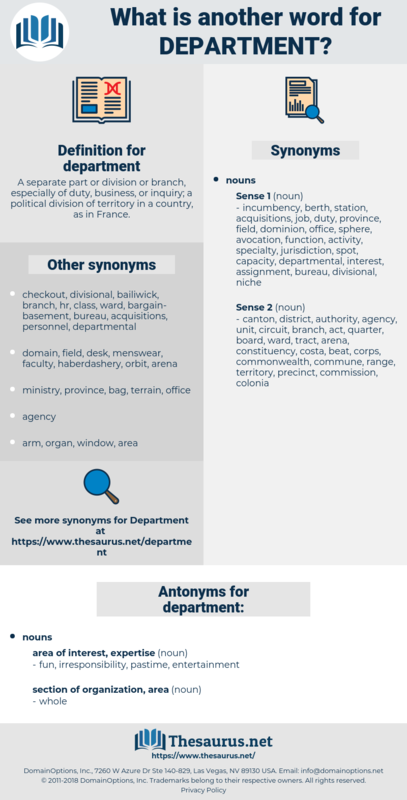 A separate part or division or branch, especially of duty, business, or inquiry; a political division of territory in a country, as in France. Recommendations, Specialists, servants, appropriations, organisms, requirements, Dentists, comments, events, clinics, projections, indicators, stakeholders, definitions, concerns, thousands, departement, competencies, Measures, mechanisms, Workshops, dept., Trustees, oceans, allegations, contracts, Studies, issues, Negotiations, Guidelines, donations, OHS, Subsidies, skills, Nas, elders, gifts, consequences, targets, DSS, media, Has, problems, claims, saws, requests, CCS, Forms, Its, goods, meetings, directorate, directorates, DEPT, secretariat, office, offices, departamento, branch, Branches. men, takes, dept., directorate, DEPT, secretariat, apartment, office, branch. ministries, ministry, administration, management, division, divisions, service. ministry, administration, management, division, service. Under Secretary of State for the Colonial Department.
" I would rather belong to two, or even three, of these good, kind boys, than to that one rude chap," said the White Rocking Horse to himself, as he swayed backward and forward on the floor in the toy department. department head, divertimento, debridement, DEP, deportment. staff office, personnel department, government department, personnel office, academic department, payroll department, security department, payroll, business department, security, personnel. administrative division, territorial division, administrative district.